We can’t believe that this was our last full week of first session!!! And, what an amazing week it has been! 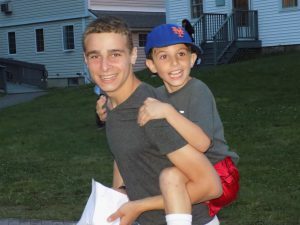 After getting back from Hampshire Hills, we had a peulat erev (evening activity) where we watched a documentary called African Exodus that was directed by the father of Jordan R., one of our chanichim (campers). 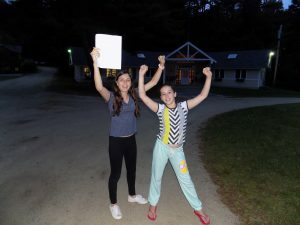 The chanichim are very interested in discussing it with Jordan’s dad when he comes to camp this Shabbat.Tuesday morning we had a choice of which alternative tefilah (prayer service) to attend with the rest of upper camp. During the day, we continued planning for Mini-Mac on Friday afternoon. This is Yavneh’s mini Maccabiah (color war) that Ma’alot gets to plan the entirety of! On Tuesday night, we watched the Kerem play, Aladdin, and got very excited that next year it would be our chanichim on stage!! For our last achla yom of the session, we went to see the movie Minions with our Gurim buddies. Now, we have Zimriyah tonight, and we’ve been working very hard on our performance, so wish us luck!! Hope to see some of you there!